A number of years ago there was very little choice in shaft materials for constructing wood arrows - Port Orford Cedar was king. It was a good choice for consistent, straight arrows and, of course, the best part of the arrow was the aroma. You didn't seem to mind as much when you broke one because you got the added benefit of enjoying the aromatic cedar. These days, Port Orford is still around, but in addition there are numerous other woods that are successfully being used to construct good quality arrow shafting. The old saying that necessity is the mother of invention applies here. In the last 5 years there has been a marked decrease in the availability of quality Port Orford cedar shafts. Some may argue that that has not been the case, but even the perception of a shortage has sent inventive people out looking at different shaft options. If you look at the most current issue of Traditional Bowhunter magazine you will find no fewer than a couple of dozen arrow shaft suppliers and fletchers offering numerous alternative shaft materials including, but not limited to: Ramin, Douglas Fir, Maple, Ash, Hickory, Pine, Sitka Spruce, Southeastern Alaskan (yellow) Cedar, Chundoo, laminated Cedar and Pine, Birch and Poplar. I am sure that I probably even left out a few materials. Whatever supplier you use, make sure that you get shafts that are hand selected for straitness, weight and spine. This will cost a little extra, but it is well worth the price. Each material has its own advantages and disadvantages. Shaft sizes can now be obtained in 5/16", 11/32" and 23/64". 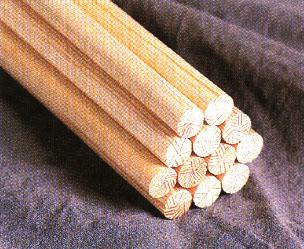 Some of the smaller diameter shafts have been compressed from a larger diameter to make a denser material. These are reminiscent of the old "Forgewood" shafts made by Bill Sweetland. I will try to concentrate on some of the more popular shaft materials and discuss some of the characteristics. Port Orford Cedar - These shafts are probably the standard by which all others are measured. There used to be two major manufacturers of Port Orford Cedar, Rose City and Acme. Acme hasn't made these shafts for several years, presumably because of difficult getting quality raw material. Rose City is still making these shafts and supplying them to various suppliers including, but not limited, to Kustom King, Cedarsmith and Sagittarius. Port Orford Cedar is best know for its wonderful aroma. The shafts are light to moderate in physical weight and are generally pretty straight grained. Cedarsmith from Montrose, Colorado is compressing cedars from 23/64" to 11/32" and thus you can get pretty high spine weights in an 11/32" shaft. A number of shaft suppliers are offering Port Orford Cedars that are tapered for about 9" on the nock end from 11/32" to 5/16". Kustom King from Merrillville, Indiana is noted for their tapered shafts. These tapered shafts are said to clear the bow riser for better arrow flight. You can also get barreled shafts that are tapered at both the nock and point ends. Douglas Fir - Douglas Fir has a lot more grain that PO Cedar and the shafts are heavier. Some of the first Douglas Fir shafts that came out several years ago had problems with consistency of weight and straitness and some were out of round. But if you can get some good, straight arrows, Douglas Fir makes very nice looking arrows given the "showy" grain. Ramin - Ramin is a hardwood from Malaysia. If you go to a hardware store and buy some wood dowels, chances are that they will be made from Ramin. Ramin is moderately heavier than PO Cedar, but has a much different grain to it. I have heard complaints about the inability to keep Ramin shafts straight. I have made arrows from 5/16" compressed Ramin and these were very nice arrows that shot extremely well. Maple - Some of the American hardwoods are starting to show up as arrow shafting material. Maple shafts are very smooth and uniform. They are also very heavy. If you are looking for good, smooth, heavy, durable shafts, then give maple a look. Ash - I will admit that I have not had the opportunity to work with ash shafts. (hey, maybe somebody will send me one) What I am hearing is that their greatest strength is just that - strength. Remember, this is the stuff that baseball bats are made from. There are a couple of eastern suppliers including Silent Pond from Whitefield, NH and Allegheny Mountain Arrow Woods from Loudersport, PA that are promoting ash shafting. There was a recent article in Traditional Bowhunter (Feb/Mar '96) describing ash shafts in more detail. Hickory - I have only seen a couple of hickory shafts and did build an arrow out of one of them. Again, these shafts are very heavy with an open grain. The ones that I had were not that straight, although I understand that there are some good Hickory shafts being made by Bowyer and Fletcher out of Berthoud, Colorado. Southeastern Alaska (yellow) Cedar - These shafts aren't yellow at all, they're white. I have made several sets of arrows from this material and was very surprised at its quality and consistency. It does have one drawback, it gives off a peculiar odor when you are grinding the point or nock tapers. Chundoo - I'll admit that I don't know much about Chundoo (I've also heard it called Sitka Pine) other than what I have read on some of the threads on some of the bulletin boards. The people that have used it seem to be sold on it. I understand that it is a little bit heavier than PO Cedar, but is straight and consistent. I am going to get some to try out. I hear that Kelly Peterson of Arrow by Kelly in Rupert, Idaho has very nice Chundoo shafts. Laminated Cedar or Pine - Shafts made from pieces of pine or cedar that have been laminated together to form a more homogeneous material are said to be made so that weight, spine and straitness can be controlled in the manufacturing process. I would be interested to know what people who have used these shafts think about their quality. A Note about Hardwood footings - Just a note about hardwood footings as we will cover them more in depth as a topic later. They can be added to just about any of the soft woods to increase the strength behind the point where most of the impact stress is concentrated. Some of the more popular woods for footing include Purpleheart and Bubinga. They are also very attractive. When I went to Missouri this fall to hunt whitetails, I took a practice shot at what I thought was a leaf, with a Port Orford Cedar arrow that had a 4 point purpleheart footing. The leaf turned out to be a rock. As luck would have it, I hit the rock. The impact split the ferrule of a 140 grain broadhead but did not damage the shaft at all.